ProTouch Pool Services is a local pool service and repair company that services Escondido. Everything from weekly Escondido pool service, pool algae cleaning, hot tub service, pool equipment repair, and pool equipment installation. Being a licensed pool contractor allows us to offer our Escondido customers the ability to help with any of your swimming pool and spa needs. A company that sets ourselves apart from the others with great customer service and extensive knowledge of the industry. Pool service in Escondido performed by our technicians is not to just remove the leaves and debris. Our pool cleaning technicians will keep the pool looking clean and clear but we also offer so much more. During each pool cleaning service visit, we make sure that your pool water chemistry is balanced. Pool water chemistry is not just adding some chlorine and filling up the floater with tablets. Just the opposite. We check all the basic and major chemical ranges that ensure the overall safety of your family and friends along with your large financial investment. During each Escondido pool cleaning service visit, we clean all of the surfaces. Being the easiest part of the pool cleaning process, this should be done every week. When you the homeowner looks out at the swimming pool, it should be crystal clear and look clean. Our technicians follow a set of procedures to ensure this happens every visit. Having procedures allows us to have all of our Escondido pool service customers get the same level of service. Below we will list our specific pool cleaning procedures. With every weekly pool service visit in Escondido, our technicians clean the pool of debris. On top of that, they check and balance all necessary pool water chemistry. Because there is no governing body regulating how this is done, it is often not right. ProTouch Pool Services takes a different approach from most other pool service companies. We follow a procedure of what to test and what to add every week. Unfortunately, homeowners are not quite sure of what is right as they have been told many variations of what is required. 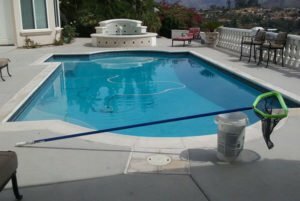 Over the time of having their swimming pool each pool cleaning company has told them how they do it and likely was insufficient or just wrong. We are here to help by giving information about pool water chemistry and what is really required. Below, we will go over the things that we test for and why. By following these procedures our pool service technicians ensure that your pool is safe to use always. When testing for chlorine, it is very important to always have a residual level of chlorine. Most pool service techs do not understand that zero chlorine may not be zero. If your reading no chlorine, it may even be a negative range. When this happens the pool may need much more chlorine than the pool service technician adds. This is often why they come back every week to test and not have chlorine in the water. Your pH is the acidity or alkaline range of your pool water. If this range is high for any length of time, you may encounter calcium build up. When the levels are high it also reduces the effectiveness of your chlorine. When the levels are low, it can be corrosive to your pool equipment and surfaces. By adjusting the acid demand during each pool service visit, the acid should be diluted. Alkalinity always need to be tested and adjusted when out to clean the pool. The alkalinity is what helps buffer your waters pH. When this range is out of balance, you may get fluctuations in your pH ranges. When adding acid to adjust alkalinity, you will also want to add it appropriately as to bring down the alkalinity.If the levels are high, you will then add sodium bicarbonate in the amount that is required. When checking for phosphates in your pool during the cleaning process, we always look to keep it below 120. 120 ppb and below prevents phosphates providing a food source to the pool algae. Any range above 120 is a open door for pool algae to spread more rapidly. We always test and add phosphate remove to prevent the need to perform a pool algae cleaning procedure. This also keeps our pool service technician from any unnecessary brushing.On top of that, pool algae is an eye soar and no one wants to have algae when paying for a professional pool service. Cyanuric acid or conditioner is probably the most important chemical range. If this chemical level is to low, your chlorine will dissipate to quickly. When this level is above the recommended maximum, it will lock out the chlorine. This means it will prevent the chlorine from being able to work effectively. Also when this level is to high, it can damage your pool equipment and pool surfaces. When providing pool service in Escondido, we always make sure to test and adjust this chemical range. We are always looking to protect your family, friends, and large financial investment. If you have a swimming pool, spa, or hot tub in Escondido and need professional help, give us a call. We can help with everything from weekly pool service, hot tub cleaning, pool algae cleaning and drain and restarts.